This is the week of Thanksgiving and my family is preparing to hit the road for a week or so. YAY! (I hate packing...just saying.) But, before we do I wanted to leave you all with a review and giveaway to keep you busy during that time. When I became a mom, my purse was put on the shelf. By this I mean that my diaper bag turned into my purse for sake of space and not enough arms to carry things!! This was extremely difficult to adjust to at first, but proved to be the most practical way to condense things. I still have one big and bulky item in my diaper bag that needs to be downsized STILL and that item is my wallet. It is full of miscellaneous cards, pictures, coupons, receipts, etc. Do you have that problem too? I mean, my wallet is obviously stuffed beyond it's capability. If you have this same issues, then pay close attention to this review...it just may be what you have been looking for to solve your problem! 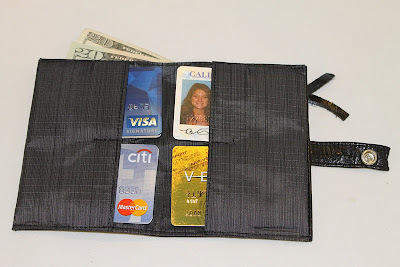 ALL-ETT Billfolds is a company that manufactures the worlds thinnest wallet and that is no joke! I heard about them from a friend of mine and checked out their website. Their wallets definitely looked thin but I wanted to see for myself. These wallets come in designs and colors for women and for men and are also stylish as well as functional. ALL-ETT Billfolds is a family owned and operated company. We pride ourselves on our magnificent customer service and our uniquely advantageous wallet. ALL-ETT was started in 1995 and has continually grown through a word of mouth, grass-roots type of marketing. The ALL-ETT World’s Thinnest Wallet was created specifically to prevent sciatic nerve damage and the back pain that comes with it. The World’s Thinnest Wallet has been featured in articles such as, The New York Times, Better Homes and Gardens Magazine, The Wall Street Journal, The San Diego Business Journal, and many more publications. ALL-ETT Billfolds and our amazing wallet are frequently featured on NPR as consumer advocate, Clark Howard’s favorite wallet (Clark is also now on CNN). Recently we as a company have been focusing on expanding our business nationally through attendance at large Expos of all kinds, including and not only Green Festivals, Chiropractic Conventions and Gift Shows. Networking nationally has brought about many new exciting PR opportunities like product reviews, write ups and radio and TV interviews. ALL-ETT Billfold team is a very rewarding experience. Hopefully one of these days we will run into you at a street fair or festival of some sort. So, for this review I was sent the Women's Original wallet. I had my choice of colors and I chose red. I also had my choice of material (nylon or leather) and I chose leather. When my wallet arrived it came in a mailing envelope and seriously, this thing is THIN!!! I was unsure of just how thin it would be, and was a bit skeptical. But, I was pleasantly surprised. As you can see, it has a zippered compartment on the outside to hold pocket change, which is nice. When you open the wallet up, it has a nylon interior and 2 bill/receipt compartments. I like this! I always hate having to put my receipts in with my bills as they get mixed up and it looks messy. So, this is a great way to separate them. 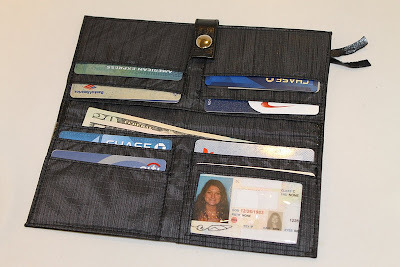 The inside of the wallet is designed to hold up to 24 credit cards (does anyone even OWN that many?? LOL!) and is pretty impressive as far as capacity. At first glance, you would not think it had that much room...but it does! This particular ALL-ETT Women's Original wallet retails for $44.95 and is available in 5 colors and two different materials. They also carry men's wallets, travel wallets and accessories. So, in my opinion...the ALL-ETT is really an ingenious invention! I never really knew anything like this existed but now, I am really excited to know that it does! This is the perfect wallet for travelers, hikers, shoppers and busy moms like me who have small areas and need compact travel accessories. I would definitely recommend this to anyone looking for a great gift for a guy, or for someone else who has everything...I'll bet that they don't have an ALL-ETT! Visit ALL-ETT and then come back here and tell me which of their products you love the most! :) You do not have to be a blogger to enter, but you must have a valid email where you can be reached should you win. If you do not leave an email address, it must be where I can easily find it. This giveaway is open to US residents and will end 12/8 at 11:59 pm EST. The winner will be chosen using random.org and will be notified by email. The winner will have 48 hours to respond, or another winner will be selected. 1. "Like" ALL-ETT on Facebook. 2 entries, so 2 comments. Disclaimer: I received no monetary compensation for this post. I did receive an ALL-ETT wallet for review purposes. All quotes and stock photos are from the ALL-ETT website and email. Prize is being provided and shipped by the sponsor. All thoughts and opinions are 100% mine. I really like the Full Leather Original. i love the full leather original mens wallet! I love the money clip. I love the women's original. I like the money clip wallet! I like the Full Leather Original wallet. The money clip wallet is really nice! I like all-ett on fb! I like the Women's Original. I think my husband would love the Full Leather Original wallet. It looks like a great one. I "Like" ALL-ETT on Facebook. I would like the full leather original wallet. I like the Inside ID wallet in black leather. Please accept my entry. Thank you.